So, when I first tapped this into Ecto a few days ago, I had just given my talk at O’Reilly Etech on Pervasive Electronic Games. I was burning a few minutes before the EFF presentation and jammed it in, went to upload a PDF of my slides and I couldn’t create a new directory on my server. I tailed /var/log/messages and saw a bunch of disk errors. Erra.. Long story, short ext3 was buoyant enough to keep enough integrity, more-or-less, to keep me humming long enough to do a fresh backup, but I basically spent two days rebuilding my system. Horrid. It’s behind me, now. 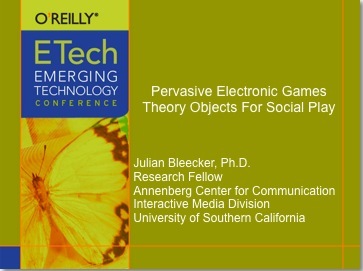 The final title that I tossed together shortly before the talk was Pervasive Electronic Games: Theory Objects For Social Play. Terribly fun presentation to give, if a bit unnerving given the brains in the audience. My main point was to figure out how to describe pervasive games as a way of creating, understanding and researching social interactions and the relationship between we and the worlds we inhabit. * Seamfulness â€” Matthew Chalmers, et. al.’s approach to confronting the pot-hole strewn mobile networks â€” is the design approach to consider creating pervasive networked experiences. The frustration induced by but one network failure is enough to sully even the most beautiful game. we can make the world more habitable and sustainable. I demo’d Clckr!..and it worked for a bit, then blew up because I’ve never tried it with more than 2 people at once. But, it worked for a minute, despite the shoddy network at the conference. And when 30 people dialed in, it kinda balked. Given that I haven’t provisioned the tech for more than a few people, that’s actually encouraging! Previous Previous post: Internet of Sticks — Now There's No Excuse Not To Get Your Spime On! Next Next post: Armitage On Controllers — Are These Controllers What We Want To Inform Game Design? Huh?